How do you like Kevin Conroy as Batman and Mark 'I'll never play the Joker again' Hamill as Joker? Yeah that's what I thought. They'll both be reprising their roles for DCU Online along with a bunch of other stars like James Marsters as Lex Luthor and Adam Baldwin as Superman. Sony Online Entertainment LLC (SOE) announced today that two of animation’s most well-known talents lead a triple-A cast of voice actors in providing their skills for the upcoming online action game, DC UniverseTM Online. Mark Hamill (Batman: Arkham Asylum, Batman: The Animated Series) will once again voice The Joker, while Kevin Conroy (Batman: The Animated Series, Justice League Unlimited, Batman: Arkham Asylum) will bring to life everyone’s favorite dark knight, Batman. Besides becoming an international pop-culture icon as the protagonist in George Lucas’ original Star Wars trilogy, Broadway veteran Mark Hamill’s career has encompassed virtually all aspects of modern media available to an actor – stage, screen, television, movies and video games. Hamill received a Drama Desk Award Nomination for Outstanding Actor in a Musical for Michael Stewart’s Harrigan ‘n’ Hart. He has also performed in hundreds of TV cartoons: Batman: The Animated Series, The Simpsons, Ren & Stimpy, Samurai Jack, Spider-Man, Powerpuff Girls, The Hulk, Fantastic Four, Little Mermaid, Phantom 2040, Johnny Bravo, Fairly Odd Parents, The Flintstones, Jonny Quest and Scooby Doo. He’s also provided his voice for several animated feature films: Joseph, Prince of Dreams, Balto II, Wizards, Batman: Mask of the Phantasm and Batman Beyond: The Return of the Joker, for which he received two “Annie” award nominations. Kevin Conroy is best known to audiences for his role as Batman in Batman: The Animated Series. Conroy continued to voice Batman in the subsequent series The New Batman Adventures, Batman Beyond, Justice League, and Justice League Unlimited. His tenure in the role also includes the films Batman: Mask of the Phantasm, Batman & Mr. Freeze: SubZero, Batman Beyond: Return of the Joker, and Batman: Mystery of the Batwoman. He also voiced Batman for the character’s guest appearances in Superman: The Animated Series, Static Shock and The Zeta Project. Conroy has also voiced Batman in the DC Universe Animated original movies Batman: Gotham Knight, Superman/Batman: Public Enemies, and Superman/Batman: Apocalypse. In a full tally of his performances, Conroy has portrayed the superhero longer than any other actor in either live-action or animation. Adam Baldwin (Superman) –Baldwin has amassed an impressive and expansive range of film roles, from large studio projects to gritty independent films. Baldwin has worked with many of Hollywood’s most successful actors and directors, including Stanley Kubrick, Kevin Costner and Richard Donner. In the sci-fi world, audiences know Baldwin for his starring role on Firefly recurring roles on The X-Files, Angel and The Visitor, and guest starring roles on Stargate SG-1 and the new The Outer Limits. He followed up his Firefly character once again in Joss Whedon’s motion picture, Serenity. This fall, he returns as John Casey in the NBC drama Chuck. Gina Torres (Wonder Woman) – Currently starring in the new ABC Family series Huge, Torres’ most notable television credits are her performances as assassin Anna Espinosa on Alias and Zoe Washburn, the shotgun-toting mercenary on Joss Whedon’s Firefly (and the feature film Serenity), in addition to her roles in Xena: Warrior Princess and Cleopatra 2525, which earned her an ALMA award. Her film credits include The Matrix Revolutions, The Matrix Reloaded, I Think I Love My Wife and Hair Show. She has also voiced the characters of Vixen in the Justice League animated series and Superwoman in the DC Universe animated feature Justice League: Crisis on Two Earths. James Marsters (Lex Luthor) – James Marsters may best be known for the role of Spike, the cult favorite punk-goth vampire that he played for six seasons on the series Buffy the Vampire Slayer and then on the final season of the spin-off show Angel. He is a headlining fan favorite at conventions worldwide honoring the show and sci-fi genre. Marsters played the role of Brainiac on the series Smallville and can also be seen in his recurring role on the hit BBC America show Torchwood, playing the ruthless and sexually deviant Captain John, as well as his recurring role on Battlestar Galactica as Barnabas Greeley. On the big screen, Marsters was featured in the live action adaptation of the hit Japanese video game Dragon Ball, in which he portrays Lord Piccolo, the evil war lord set on destroying the earth. Marsters’ upcoming role will be as the recurring villain on CBS’s reboot of the classic series Hawaii Five-O. Michelle Forbes (Circe) – One of the industry’s most prolific actors, Forbes brings an intense quality to every role she tackles. She has appeared in such independent films as Kalifornia and Swimming with Sharks. Last year she made her debut in the groundbreaking HBO series True Blood starring as Maryann, a wealthy local who has mysterious intentions. She has also appeared as Kate Weston in the critically acclaimed HBO series In Treatment. In 2005, Forbes received rave reviews when she starred as Admiral Helena Cain in the intelligent and politically charged series Battlestar Galactica. In DC Universe Online, players will be thrust headlong into an action-packed online world based on the heroes, villains and landmarks of the DC Universe. In the game, players step into the role of the next legendary superhero or villain and are given the choice to save or conquer the universe online. Along the way, players will be fighting alongside or against iconic DC characters as well as other players for the fate of the DC Universe. 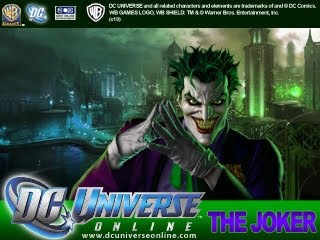 DC Universe Online is scheduled to ship November 2, 2010 for both the PC and the PLAYSTATION® 3 Computer Entertainment System, and his expected to carry a rating of “T” (for Teen) by the ESRB. For more information, check out the product website at www.dcuniverseonline.com. Dungeon Siege 3 Screens looks Siegetastic! Street Fighter X Tekken announced at ComiCon! What is Mega Man Universe?